Mungo MacCallum questioned accepted values all his life. As a distinguished journalist, writer and broadcaster he was known for his satirical wit and sense of the absurd. MacCallum was born in the Sydney harbourside suburb of Point Piper in 1913. His father was a lawyer turned leader writer on the Sydney Morning Herald. Mungo followed him into the newspaper business, joining the Herald as a cadet journalist. When war broke out in 1939 he enlisted and soon found himself editing an army journal called SALT . This, he says, was "political dynamite" as the journal ran articles questioning the establishment and its social attitudes. Returning to civilian life, he was given a column on the Sydney Sun newspaper in which he turned his scathing eye and pen on a wide range of targets. However, overwork and a continuing problem with drinking led to a nervous breakdown. After recovering, he changed careers and joined the Australian Broadcasting Commission where he developed a successful career writing radio features. In the 1950s the ABC sent MacCallum to England to find out about the new medium of television. 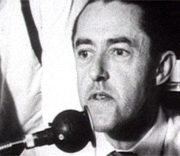 He returned to Australia to become head of television training, and produced the ABC's first television broadcast. MacCallum won an Australian Writers' Guild award for his radio program Stone Bloody Henge. A move into ABC management caused more problems with overwork and another nervous breakdown, and led to his becoming a freelance broadcaster-a role in which he feels he did some of his most important work. MacCallum, who at the time of this interview lived in Sydney with his second wife Polly, wrote two novels, Voyage of Love and Son of Mars , and an autobiography Plankton's Luck.